If we were to knock together an old-fashioned ‘someting meets something’ comparison to describe The Spectrum Retreat, ‘Gone Home-meets-Portal in the hotel from The Shining’ would probably fit the bill. That conveys the tone of this FPS narrative puzzler but saddles it with expectations any developer would struggle to meet, let alone a tiny indie studio. However, designer Dan Smith seems to invite comparisons with those genre-definers and it’s hard to shake them. The fact that it doesn’t crumble under the weight of those influences is impressive. You awake every day (“Okay campers, rise and shine!”) in The Penrose Hotel to a polite knock at your door. A robotic concierge informs you that breakfast is served downstairs and you meander through the curiously empty hotel to the restaurant. Soon you begin hearing a mysterious voice imploring you to investigate this uncanny place without alerting the mannequin-like hotel staff. They’re a disquieting bunch – their mouthpieces light up and their heads move but they’re otherwise static, like the rest of the hotel. 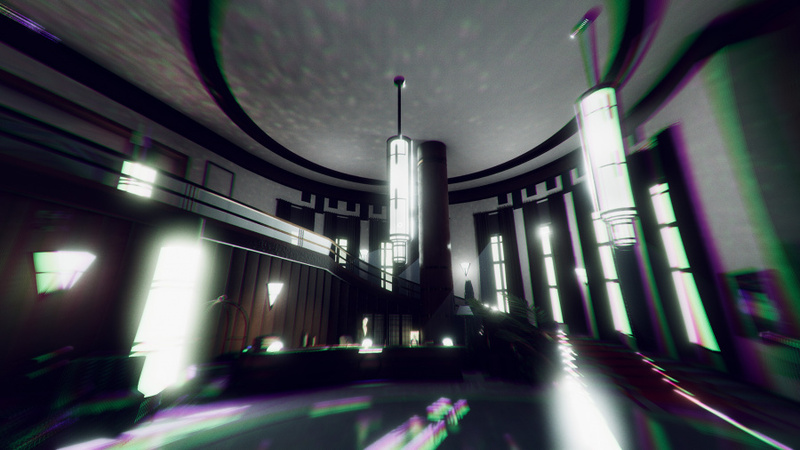 You interact with occasional objects by pressing ‘ZR’, with movement and camera controlled by the analog sticks. Navigating the long corridors feels slow and soupy at first and you’ll find yourself scrutinising blocky shadow maps and incongruous shafts of light on the corridor carpet. As the story progresses, intentional visual anomalies crop up; things are not what they appear, although you’ll have guessed that already. Despite building tension and even offering a couple of effective jump scares, the hotel sections could do with some tightening. The voice over from your handler is serviceable but pauses and breaks in the script feel laboured and the dialogue lacks punch. Occasionally it triggers a fraction too early or is overlapped by speech from hotel staff. There’s a huge gulf between ‘almost there’ and ‘perfect’ and these sections never quite hit the mark. Fortunately, the puzzle sections are another matter entirely. You unlock elevators that ascend to surreal puzzle chambers with ‘authentication challenges’ – environmental puzzles that rely on glowing coloured cubes that litter the courses. Each colour corresponds to a matching forcefield, and ‘firing’ at a cube with ‘ZR’ exchanges the colour you’re ‘carrying’ for that of your target. 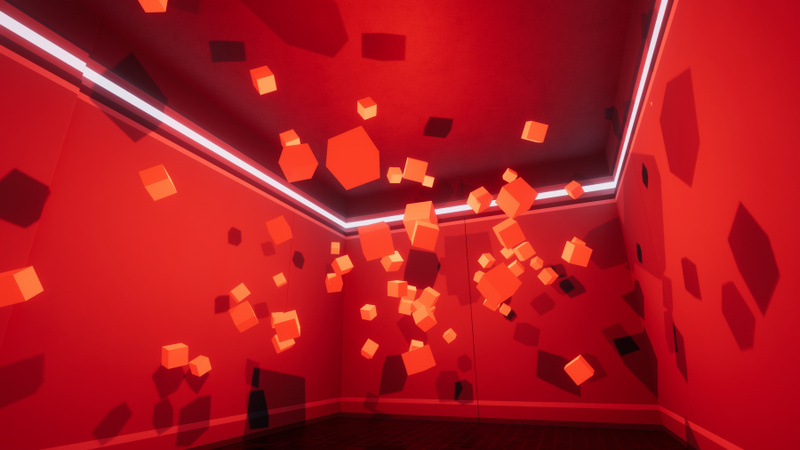 Your circular mobile device acts as an onscreen HUD indicating your current colour, so zapping a red cube enables you to pass through red barriers until you switch with another cube. Progress is made by swapping ‘permissions’ and navigating through mazes to an exit elevator. 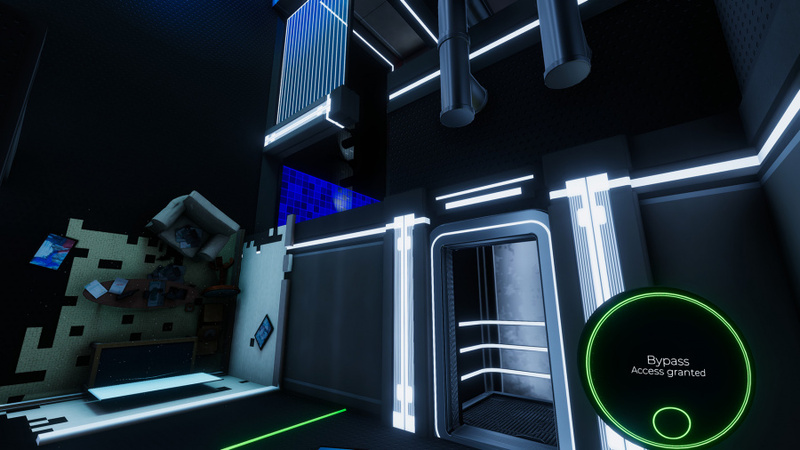 Test chambers, cubes, forcefields, elevators – the influence comes through loud and clear but, incredibly, The Spectrum Retreat really holds its own on the puzzle front. The concept takes a while to sink in and you develop an intuition for solutions before you actually ‘get’ it. 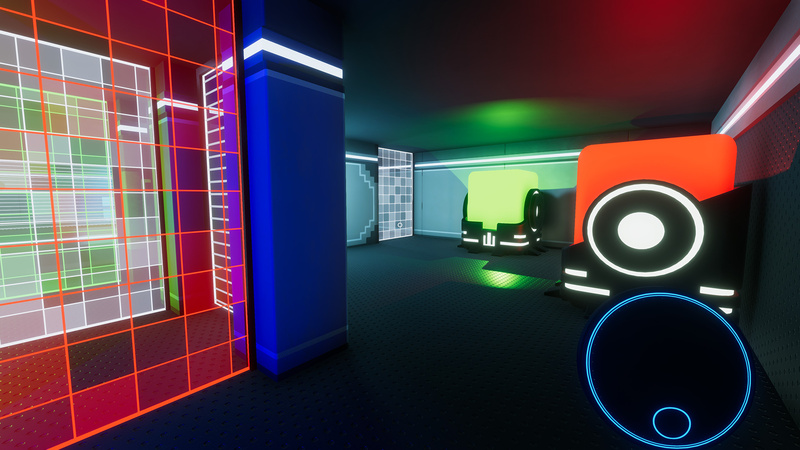 New colours create more intricate rooms and later levels introduce colour-coded walkways, ‘hookshot’ points and pressure pads which alter gravity. Special cubes make it possible to ‘overwrite’ (rather than swap) your colour, which can lead to dead ends and necessitate restarts from the pause menu, but the puzzles are nevertheless elegant and extremely satisfying to solve. Controls are responsive, although we found lining up our sights fiddly, especially at a distance; we’ll be happy campers when optional gyro aiming becomes the norm. As with many other Switch games, the rumble implementation is teeth-rattling and the noise proved distracting – we jumped into the system menu and turned it off, pronto. Graphically, everything else looks clean and sharp however you’re playing (low-resolution shadows notwithstanding) and the framerate is consistent. Viewing forcefields through forcefields of different hues is a potential nightmare but the visual design makes things eminently readable – it’s never confusing, even when rooms begin looping and rotating. The game takes on the feeling of a prison escape as you break out the colours you need from their cells and manoeuvre to the exit. While the narrative hotel sections and puzzle rooms are somewhat compartmentalised and separate, there’s a satisfying alignment in the psychology of the two portions. Which brings us back to Portal, the brilliance of which stems from how it seamlessly and unobtrusively wove story and mechanics together. The precision and polish required to make that work is still a marvel over a decade on, but it meant keeping players on an extremely tight leash. 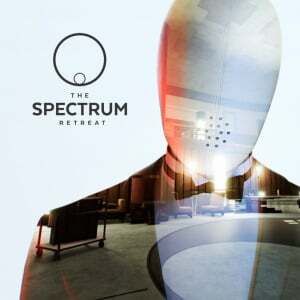 The Spectrum Retreat is similarly linear (and brief) but splits the bulk of its narrative into the separate, more expansive hotel environment. It’s a welcome change of scenery from endless test chambers, but the resulting experience is inevitably less intense. The Spectrum Retreat is a valiant stab at a Portal-esque puzzler which largely pulls off what it sets out to achieve. It lacks the dynamite script and surgical timing of Valve’s masterpiece, but the test chambers (sorry, ‘authentication challenges’) withstand the comparison. If Gone Home’s pace is a touch too navel-gazing for your liking, we’d heartily recommend a trip to The Penrose Hotel. This sounds really tasty. Tasty as in, I’m going to eat this up. Seems to have a really cool atmosphere and mashes lots into one package, while holding a tight balance throughout. Some might call it a modern marvel. Definitely going to check this out! Is it better than ChromaGun? This going on my wish list. I loved the Portal games, though admittedly as much I enjoyed the gameplay, my favourite thing was the hilarious dialogue more than anything. Speaking of which... Portal 2 should really come to Switch, with JoyCon gyro aiming and the In Motion DLC. It would be a perfect fit and probably reach a lot of new audiences. I would bet that very few people ever experienced the In Motion content, based on the lack of PS Move success. This sounds intriguing and you had me at "Portal." Honestly, though, I really do just wish Valve would release the Portal collection on the Switch with gyro controls. It's been long enough ago that I've forgotten most of the puzzles. Seems like it would be an easy port that would undoubtedly sell quite a few copies (especially if they added some added some additional puzzles for veterans of the series). This looks amazing; bit disappointing that it has no relation to the Speccy, but I suppose the word does have other meanings.